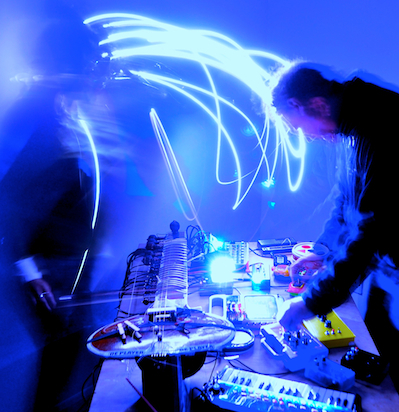 The duo have worked with a range of musicians and artists including, Noise=Noise, Steve Beresford, Satoko Fukada, Aisha Orazbayeva, Kammer Klang, Roger Turner, Sharon Gal and John Edwards. Commissions include Khoj Delhi (India), Clandestino Festival (Sweden), REProduce (India), Colour Out of Space Festival, Optophonic (UK) The Serpentine Gallery (UK), Futuresonic (UK), Souzouzukan 9001(Japan), The Oxford Gallery (India), INIVA, Supernornal Festival (UK) Home Live Art (UK), and The Queens Museum (USA). Their ‘Usurp Chance Tour’ with Stewart Lee, Seth Ayyaz, Steve Beresford, Tania Chen and Roger Turner, explored perceptual concepts of chance, time, listening and humour, and the breadth and parameters of improvisational approaches in new music.